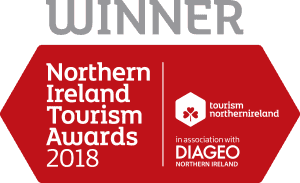 Crumlin Road Gaol have captured the award for Tourism Heritage Property of the Year 2018 at the Northern Ireland Tourism Awards 2018. Crumlin Road Gaol has grown to be a multi-purpose destination; as well as offering public guided tours and today is one of Belfast’s top tourist attraction which is graded 5 stars by Tourism NI. Since reopening in 2012 it has seen expansion of services and facilities in the business and entertainment sectors. Pictured receiving the award is Phelim Devlin from Crumlin Road Gaol alongside Terry McCartney, board member of category sponsor Tourism NI. Speaking at the event, Tourism NI Chairman, Terence Brannigan, said: “Northern Ireland’s attractiveness as a tourist destination has come a long way in the last three or four decades. When you compare today with 1978, the step changes that have happened in our industry cannot be missed nor underestimated. In the last six years, in particular the sector has performed consistently well.